Our review of Captain Olimar's transition to the puzzle platforming genre. Few people remember it now, but Pikmin was quietly a little bit of a revolution when it first came out on the GameCube back in 2001. In their own quirky way, Nintendo managed to reinvent the real-time strategy genre for console, something even genre masters like Blizzard never quite managed. Hey! Pikmin—the new spinoff for the Nintendo 3DS—attempts to recapture some of that feeling, but it's ultimately on much more familiar ground. In moving the cult favorite series to the 3DS, Nintendo has turned Pikmin into a pleasant if rather simple puzzle platformer. The familiar elements are there—the different types of Pikmin, the giant predators, and so forth. But Hey! Pikmin emphasizes path discovery and item collection over strategy, with fair if not overwhelmingly amazing results. 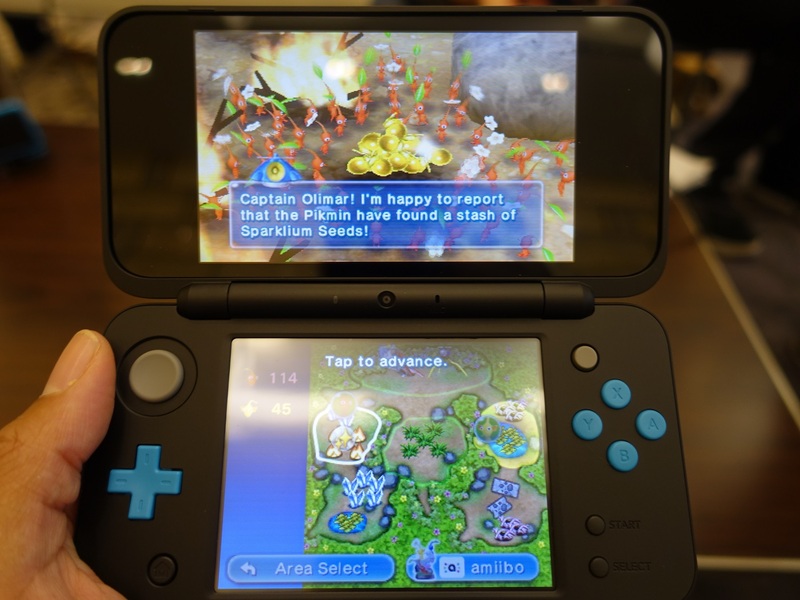 The story follows Captain Olimar as he once again crashes on an alien planet and seeks to repair his ship (someone should really revoke his pilot's license at this point). Assisting him are the eponymous Pikmin—multicolored creatures with strengths that correspond to their color. 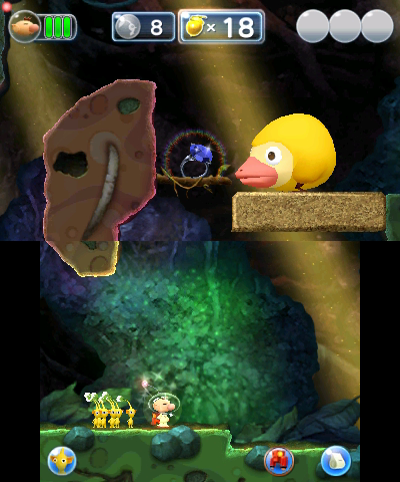 Blue Pikmin are particularly well-suited to aquatic environments, for instance, while Rock Pikmin can smash through crystals to access news areas. Understanding these properties is key to progressing through Hey! Pikmin's generally simple but engaging environmental puzzles. Pikmin are obtained by walking up to a bush or a rock and whistling, causing them to pop out and start following Olimar. You can command them simply by tossing them at a desired object, which they then dutifully move or attack. Sometimes they're needed to complete an electrical circuit, other times you need them to carry a heavy piece of treasure. Whatever the case, they are your most important asset. Unfortunately for you, Pikmin also happen to be delicious. As such, your primary enemies are predators who will attempt to devour your Pikmin, lessening your overall capabilities. I always liked this aspect of Pikmin, by the way—it makes the world you're occupying feel truly alive. And Pikmin's predators are memorable, capably straddling the line between cartoonish and genuinely intimidating. Many of them are so big that they occupy both screens, and look as if they are capable of devouring Olimar in a single gulp. But for all their size, they will never make you feel as if you're genuinely in danger. That's because they're generally easy to kill (wait til they turn their back and toss Pikmin at them), and because Pikmin are a renewable resource—if you lose a bunch, you can always call out more from a nearby bush. This has the effect of moving the onus from survival to item collection and puzzle solving, with predators and bosses being at best a minor inconvenience. The worst that can happen is that Olimar gets so hurt that he has to return to his ship, forcing you to restart the level. But it's not until the late part of the game that this is actually on the table. I should add that it doesn't particularly bother me that Hey! Pikmin is as easy as it is. It's perfectly fine for a puzzle platformer to emphasize traversal challenges over raw difficulty if the puzzles are interesting enough. But Hey! Pikmin's levels tend to be fairly one-dimension—once you figure out the trick, it's pretty easy to figure out how to proceed. The greatest challenge is in collecting all three treasures in a given level, which provide you with the resources you need to fix your ship. In that, it has a certain appeal for completionists. But I found that the lack of complicated puzzles and powerful enemies made the actual exploration feel somewhat rote. Hey! Pikmin's level design is further dulled by the fact that they all look kind of similar to one another. Sure, one might be a water level and another a crystal level; but with most of them taking place in deep tunnels, they tend to blend together a little. Outside of the enemies—which are impressive—the enironmental art lacks the lush feeling of past Pikmin games, which I suppose is a consequence of moving from console to the 3DS. When you're not exploring, you're putting your Pikmin to work digging up treasure by assigning them to element appropriate areas. There's not really much to it: You assign your Pikmin and leave them to their work. Sometimes you will get some treasure out of it. It feels a little undercooked, which is something that can be said for Hey! Pikmin in general. Even the Amiibo support, which dominates the main map with its promises of access to "Secret Spots," only yield very brief and underwhelming levels. I guess this is all to say that Hey! Pikmin never really grabbed me. It's a decent little time-waster for completionists who enjoy puzzle-solving and exploration; but outside of its name, there's little to distinguish it from the hundreds of other puzzle platformers available right now. But with all that said, I do appreciate that Nintendo is taking the time to mess around a bit with an established franchise, even if the results aren't necessarily thrilling. There's a decent foundation here; and if Nintendo should decide to make a sequel, there's plenty to build from. But as bold experiments go, Hey! Pikmin is merely okay. And like the tiny aliens that serve as its namesake, it's apt to fade into the background. A simple mix of the analog stick and the stylus is enough to navigate Hey! Pikmin's world. Tapping the top of the bottom screen to toss Pikmin up to the top screen is a little awkward, but not so much that it's an active detriment. I really like the sound effects in Hey! Pikmin, especially the distinctive cries of the predators. But more often than not, I found myself playing with the sound off and not missing it. Hey! 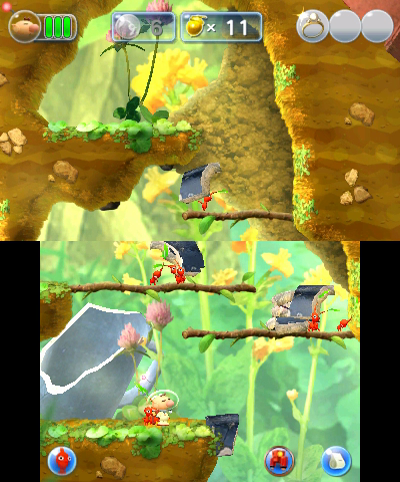 Pikmin faithfully adapts the look and feel of the original game to 2D, particularly the massive predators. It's a very nice looking game overall. Hey! Pikmin is an interesting reinvention for the series, but it doesn't really go deep enough to be an interesting and rewarding puzzle platformer. It winds up being an adequately executed collect-a-thon—a time-waster that offers a new take on a familiar formula, but fails to take it in any bold new direction.